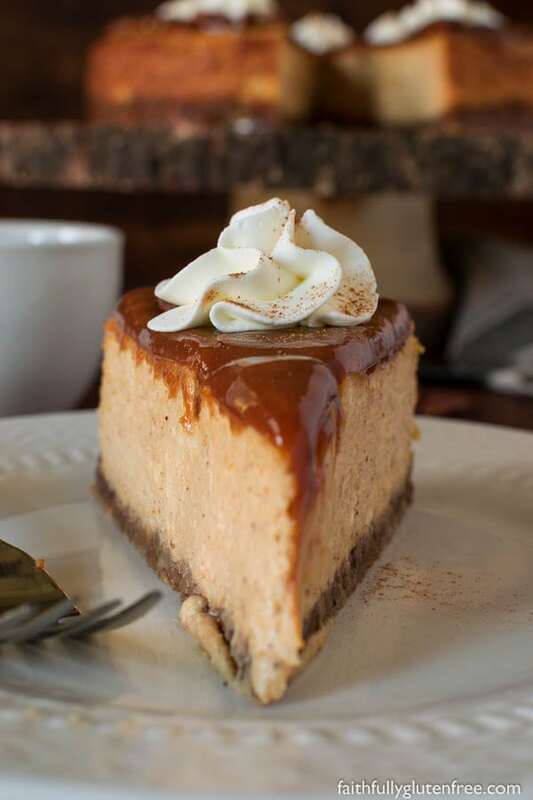 Indulge in this gluten free Pumpkin Cheesecake, with it’s velvety texture, warming spices, and nutty crust, everyone is sure to ask for another slice. Look at that picture. It’s OK, I’ll give you a moment. The taste of pumpkin, with it’s warm, spicy accompaniment. 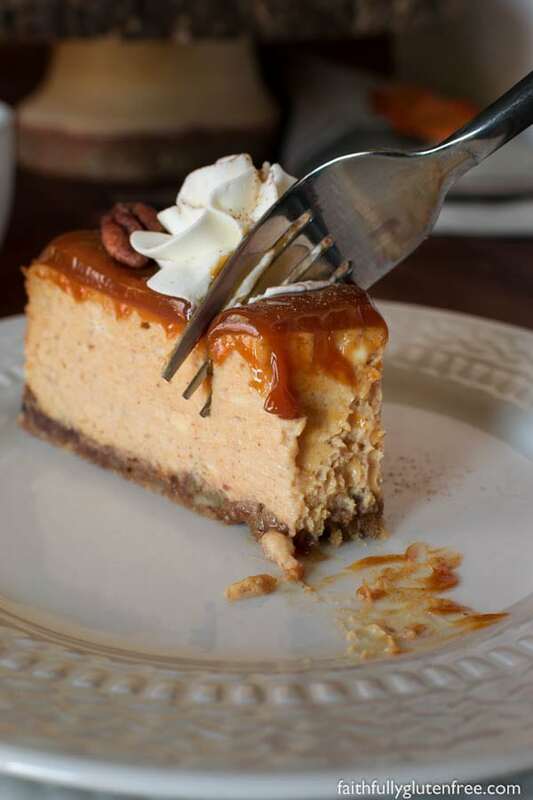 Ah…this gluten free Pumpkin Cheesecake is perfection on a plate. I first shared this recipe here 8 years ago. I knew that it was a good recipe. I served it at my husband’s birthday party, and it got rave reviews from everyone. Then six years ago I entered this recipe into a national baking contest and won a trip for my Mom & I to fly to Toronto to attend Canada’s Baking and Sweets Show. It truly is a real winner. I hadn’t made it often since, but with Thanksgiving coming up, I thought it would be the perfect indulgence. First bite – I was won over again. I had forgotten just how smooth it was, and how nicely balanced the flavours are. Those pecans in the crust give it a great nutty flavour without being over-powering. And you see that Dulce de Leche on the top? It will save you ever time. If your cheesecake cracks while it is baking or cooling – no one will ever know. Smear on a layer of this sweet golden happiness, and everyone will think you are a flawless baker. Win – Win. 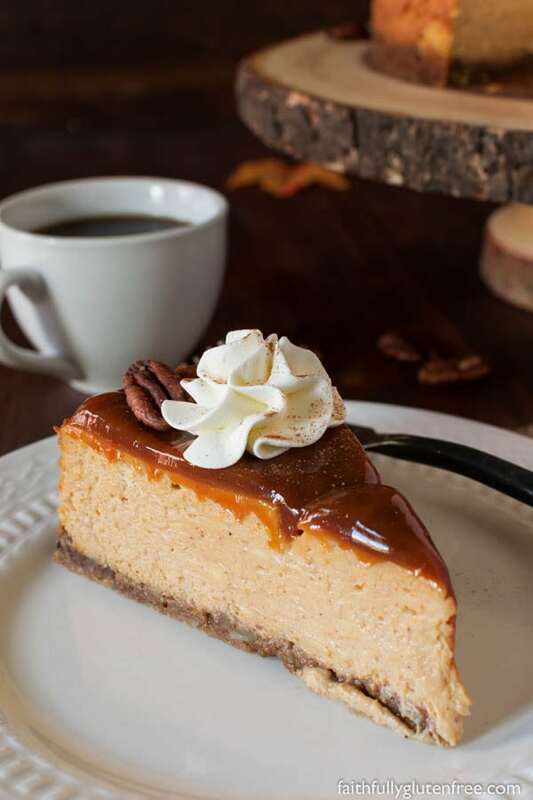 Indulge in this gluten free Pumpkin Cheesecake, with it's velvety texture, warming spices, and nutty crust, everyone is sure to ask for another slice. 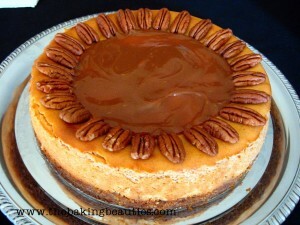 Optional: whole pecans and a jar of Dulce de Leche to decorate the top of the cheesecake with. You could also use whipped cream, if you wish. Combine the graham wafer crumbs, ground pecans, 2 tablespoons granulated sugar, 2 tablespoons brown sugar, and the melted butter and mix well. Firmly press into one 9-inch springform pan. Combine 3/4 cup granulated sugar, pumpkin puree, 3 egg yolks, spices and salt in a medium bowl. Mix well and set aside. Beat the cream cheese with an electric mixer until light and fluffy; gradually add 1/4 cup plus 2 tablespoons granulated sugar and mix well. Add the whole egg, remaining egg yolk, and the whipping cream, beating well. Add cornstarch and vanilla extract, beat batter until smooth. Add pumpkin puree mixture and mix well. Pour batter into prepared pan. (Note: I placed my springform pan on a cookie sheet with sides, and I'm glad that I did, because I had some liquid leaking from the springform pan. Keep that in mind!). Bake in preheated oven for 50-55 minutes. Do not overbake. Center may be soft but it will firm up when chilled. At this point, turn the oven off, and open the oven door, but allow cake to remain in oven for the next hour. This will help prevent the top from cracking, but if it does, don't worry, that's where the Dulce de Leche comes in handy. Cover and refrigerate until ready to serve. I removed the springform pan and decorated the top with Dulce de Leche and whole pecans a few hours before serving, then placed in the fridge until we were ready to eat. Instead of gluten free graham wafers for the crust, you can use gluten free gingersnap cookies or Cinnamon Chex. 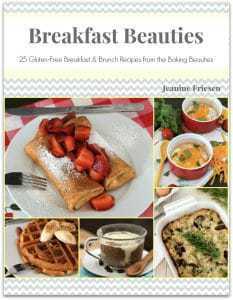 Images & recipe updated October 2018. What a gorgeous cheesecake!! I am in such a pumpkin mood lately, I can't seem to get enough. Always looking for new ideas. Thanks for the inspiration. This is TOTALLY perfection on a plate! Love all the different flavors and tectures you have going on here. Thanks, Eliana! Such a great combination of flavours, and actually, pretty easy to make (bonus!). That is beautiful! WOW! I've never tried Cinnamon Chex, great idea. This is GORGEOUS. Love the cinnamon chex idea. I had to stop by and comment on this gorgeous cheesecake. I bet it taste as good as it looks. 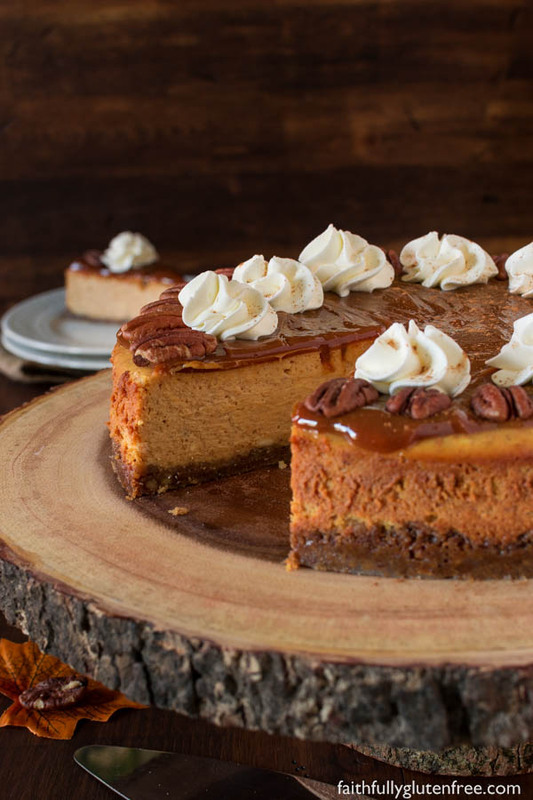 Pumpkin Cheese cake has been a family favorite of ours for a VERY long time and always on the Thanksgiving menu. Nice decoration work!!! wow! Thanks for posting….that looks HEAVENLY! Definitely going to try this out. I know I commented on this once already, but I just had to come back after I saw it on GF Holiday at Gluten Free Easily. Drool. Yum. My daughter and fiance made this for me, minus the pecan though I'm not a fan of pecans, and we just had it about 10 minutes ago. It is easily my favorite cheesecake ever! Even better than the pumpkin cheesecake from the Cheesecake Factory! They used crushed walnuts in the crust. This was DELICIOUS!!!!!! My husband didn't crush the chex enough so next time I am gonna have him blend it up to a powder instead, it was kinda crunchy, chewy consistence. But it was really good. We couldn't find the Dulce de Leche. So we didn't add that, it was delicious on its own. My husband thought it tasted alittle too much like pumpkin pie so he said next time he will add leave spices so it tastes a little more cream cheesey! Thanks for sharing it! 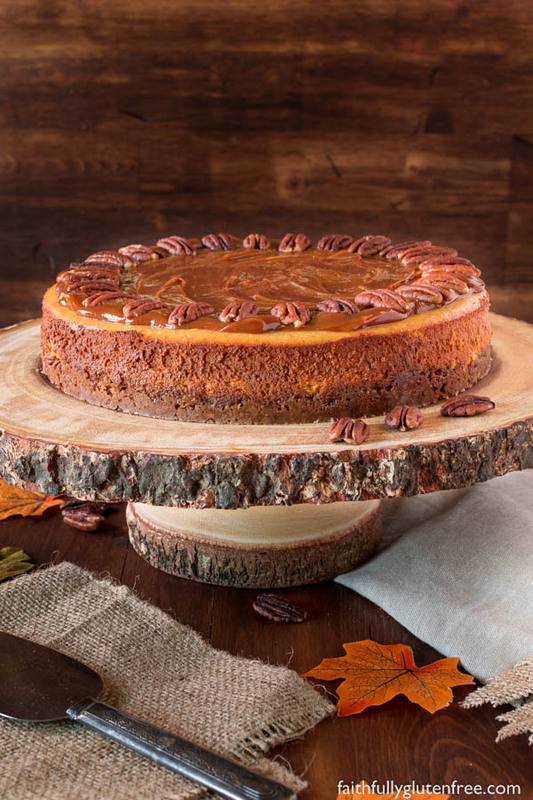 My daughter has been begging me for a gluten free pumpkin cheese cake and this looks great but she also has a peanut/tree nut allergy, so my question is can I do this peanut/tree nut free? I made this cheesecake for Thanksgiving and it was absolutely the best cheesecake I’ve ever had! For the crust, I used a mixture of honey chex and corn chex and it came out great except that it did split a little on top so I’ll do a water bath next time, otherwise it was wonderful! Awesome!! Glad to hear that, Kay! I think mine cracked a little too, but that’s where the caramel on top comes in. 😉 Covers all! This looks AMAZING! Will have to fool around with it and make it dairy free as well. Hope mine turns out as pretty!!!!! All your recipes looks delicious. Unfortunately, I cannot eat anything like that. You see, besides being celiac, I am also lactose intolerant. 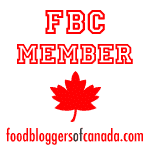 I was just wondering if it is possible to have gluten free recipes without any dairy products. My daughter also has Celiac and she asked for Pumpkin Cheesecake for her Birthday. I always make what they want so I went looking for one and found yours. Nervously I made it and ser. ved it to our guests. This goes to the top of the class it was amazing. It’s not to sweet and it’s not overpowering with the taste of pumpkin. It’s just right. Thanks for making my daughter’s day and making me look good. Does this freeze well? Where can you but the dulce de leche? Cheesecake does freeze well, I would maybe reserve topping it with the dulce de leche until you are ready to serve it, as I don’t know how that would freeze. Thanks! I’m making this as the GF option of 5 various cheesecakes I’m making for a wedding this weekend. Mmmmmm! Just made this! Your directions were great and it looks good….just waiting for it to settle. Made this for a fall party last year–huge hit, I can’t wait to make it again this year! Delicious! Good luck, Kelsey! It was a winner for me, I hope it is for you too! The cheesecake looks amazing and I’m itching to make it, there is one thing though… CAN YOU RECOMMEND AN alternative to cornstarch? It’s only 1 tbsp of cornstarch, so I’d think using a potato or tapioca starch should work without a problem, or even white rice flour. Can’t use those, it would probably even work without, but I haven’t tried it. I made this delicious cheesecake last year for Thanksgiving, it was an absolute hit. Thank you so much for sharing. I am getting my shopping list ready, and will be making it for Thanksgiving again this year. Just made this for thanksgiving dinner today and it was hands-down the best dessert i have EVER made (gluten free or not). Came out perfectly — and the “leaving in the oven” with the door open trick worked like a charm. I did not put the dulce de leche on top — and honestly, for me, i don’t think you need it. Thanks so much for this recipe! Hi….going to make for our thanksgiving dinner. What size springform pan is needed? I have a 8,9, and 10. I made this recipe using the gluten free graham style crackers. It turned out very well. Pumpkin flavor was delicate — even those who disliked pumpkin pie enjoyed this recipe. I baked it the full time, it cracked a bit in the oven during the cooling process — adding the dulce de Le he (which I made) covered any cracking. Also, the center of the top falls somewhat during cooling — again, the dulce de Le he helps to hide this. Even though I baked it for the 55 minutes (conventional oven @350) it was a very moist cheesecake. It was somewhat difficult to cut, as I had to clean the knife after each cut. I served with slightly sweetened whipped cream. Also, I was careful to press the crumb crust up the sides a bit to prevent leaking, but I think the butter in the crust still leaked through, cookie sheet caught it all. This was a HUGE hit at our family’s T-day gathering. I didn’t use the pecan topping as we have a family member with severe nut allergy, so I drizzled the Mrs. Richard’s Carmel topping across the top of the pie (mine didn’t crack either!). I also didn’t have regular cream cheese – used Neufachel- worked just fine. Baked mine for almost 60 mins, and in oven for 40 after baking for cool-down. I didn’t have a spring form pan, so I used a 9” cake pan-turned out great! I don’t have a pic because it was all devoured! I also used rice Chex cereal with the cinnamon/sugar and butter as suggested for the crust… Will make again and again! 10 stars!